Oh right, I did. Remember those dark days before the internet, when curious cooks actually had to clip recipes from newspapers and magazines, and keeping those clippings organized in some sort of book or box? Nope, me neither. Going through this binder is fascinating for me as I see what kind of recipe hopes I’d had ten years ago — a surprising amount I’ve actually gotten to. And of course there are things that I completely forgot about, like almond cookies that are made with only three ingredients (okay, four, I added salt). But I’ll let you decide. If they look a bit like uber-trendy macarons, it’s is because they have a lot in common with them — they both involve slightly aged egg whites, ground almonds, sugar and not a whole lot else. And yet, they’re a heck of a lot easier to make, not leaving you crossing your fingers that the macaron faeries will grace your batch with the ideal level of humidity and a perfectly formed “foot”. In fact, the only downside of these cookies at all is that like many other macarons, macaroons and meringues, they’re sweet, very sweet. If you try them with less sugar, please let us know how it goes in the comments. And yes, this is not the original source of the almond cookie recipe I’ve had for ages, but it looked even easier and who can argue with that? Preheat oven to 300°F and place racks in the upper and lower thirds of your oven. Line two large sheet pans with parchment paper. 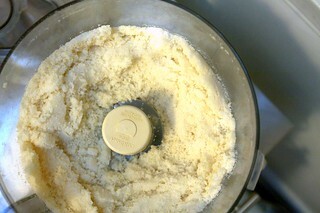 Pulse almond paste, sugar and salt in a food processor until broken up, then add egg whites and puree until smooth. 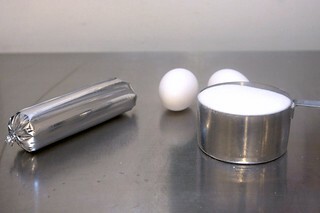 Transfer batter to pastry bag fitted with a 3/8-inch tip and pipe 3/4-inch rounds (1/3 inch high) about 1-inch apart in pans. Dip a fingertip in water and gently tamp down any peaks. Bake, rotating and switching position of pans halfway through, until golden and puffed, 15 to 18 minutes. Let cookies cool almost completely in their pans. Once cool, they’re much easier to cleanly remove from the parchment. 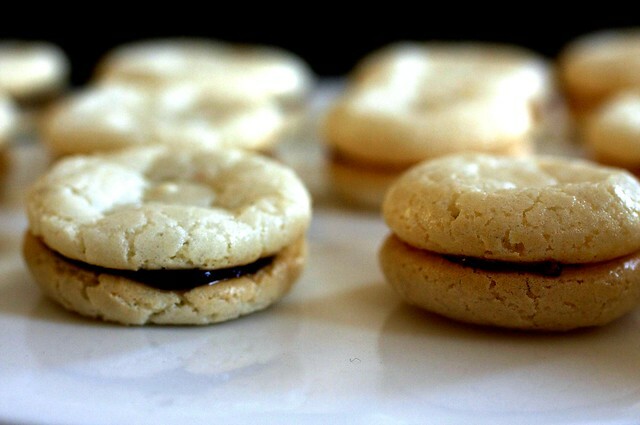 You can make them into sandwich cookies but spreading some jam (I used raspberry) between them or ganache (3 ounces of semi-sweet chips melted with 1 to 2 tablespoons of cream, then left to thicken a bit would be enough to sandwich the whole batch). Cookies can be kept in an airtight container at room temperature for a day or two or frozen up to one month. i saw the same recipe when it first came out.. now i just have to jump on the bandwagon and bake these! As far as I’m concerned, moving is the WORST necessary task ever. I’m sure these cookies will help with the process. I am certainly going to make them! Ahh, hang in there with the move!! Ooh these look delicious, I love love LOVE almond cookies! good luck on the move. such a pain! There was a time before the internet? I don’t know what you’re talking about. Looks easy and delish, like always. AND you’re right! Kosher for Passover. Rock! For the poor college students amongst us who don’t own a food processor – Would a whisk work instead? I have an actual recipe box…it would probably be a valuable antique by now, if now for it’s poor quality (plastic) and icky color (dusty blue – remember that one? It went along with dusty rose). These cookies look yummy and I love the idea of raspberry jam between the layers. Must make soon. After Easter and I can gobble the sugar again. No way these would work with agave syrup, right?? You need the sugar to do its magic with the egg whites for puffing and creating a crunchy morsel? Good luck with the move. I can’t believe you are managing to try new recipes in the midst of it. These look awesome, though when people say “amaretti” I always think of the kind that come in that cool red square tin. I actually still keep a recipe binder, with clear plastic sleeves. It’s where I put recipes that I’ve cut out of magazines so I can be sure to forget about them as soon as possible. By the way, I am beginning to design the Veselka Cookbook as we speak, and I believe there is a copy with your name on it. When such copies exist. Cookies look wonderful–and so easy! I just went through a move, too–definitely know what you mean about all that STUFF and finding things you completely forgot about. It’s amazing. I SO want to make these, although I am fearful that if I do, I will eat the WHOLE batch. Uh oh. I feel for you on the moving thing! We moved a few years ago, and I dread the very thought of ever doing it again. Good luck! Nurit from 1 Family. Friendly. Food. The cookies look great but I’m not for the challenge of testing them with less sugar. I really don’t like very sugary cookies, or any dessert, either. these are too cute! best of luck packing and congrats on the new place! Thank you for this recipe, and the links to other Passover desserts! I’ve been assigned to make a dessert for my family dinner and I’m like “uhhhh, how about chocolate chips? ?” These look great! good luck with the move. be careful lifting those boxes! Aww, even though I’m a Gen-Yer, I still use the recipe binder method! What snazzy internet tool do you use? Maybe I’ll consider switching sometime soon. Funny story though, when my grandmother passed away last year and we sifted through her things, I found 3 huge old recipe binders that she had kept. It made me feel so connected to her, and I love that we share the recipe pack rat syndrome. Good luck with the move! I tore out this recipe when I saw it in Gourmet, but haven’t gotten around to making it yet. They look delicious! Hello, I’ve just found you through a website called Likaholix and I think I might be in love with you – or at least your chocolate wafers! I just wanted to say that I do still keep a ringbinder with recipes in plastic sleeves that I’ve cut out of magazines, printed from the internet or blackmailed friends into giving me. I use it more than any of my recipe books. Every now and then I go through and cull the recipes that I don’t use. Don’t think any of your recipes will fall into that category! P.S. I’m totally blaming you when none of my pants fit anymore. 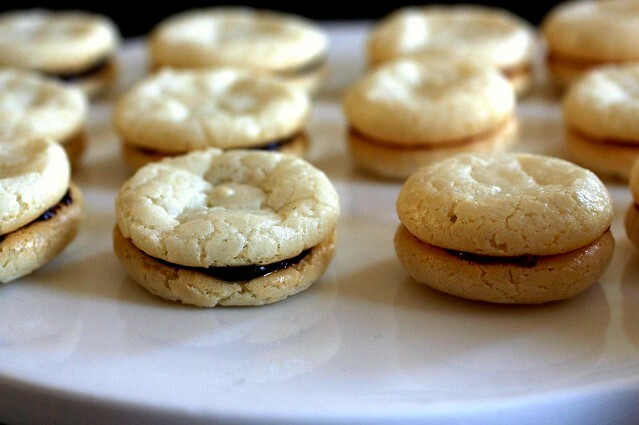 Bridgett – almond paste is really easy to make if you use a food processor. I just made mandelhoernchen for a friend and made my own (fwiw, mandelhoernchen are essentially this dough, rolled into little horns, covered in sliced almonds, with ends dipped in chocolate after baking and cooling). Bria- Do you have a great recipe for mandelhoernchen? Love almond flavors in cookies! Easy is good. We like easy. I was actually in Whole Foods yesterday staring at the almond paste and thinking, “I have no plans for it. Should I get it anyway?” Well, I didn’t get it and now look what happened! Hey! I still have a recipe binder and I just used it today, too! I hate moving—my heart goes out to you. I think you may be evil. PS — You could probably toss some pignolis on top and make Pignoli cookies. where are you moving to! I swore that my mother-in-law would be doing all of the heavy lifting for our seder next week, but then you come along with the perfect recipe and I just don’t think I’ll be able to stay out of the kitchen. It’s just as well; I’ve been wondering what to do with the almond paste that’s been sitting in my pantry (other than squeezing it directly into my mouth). These look so light and airy! I adore marzipan as well; thanks for the recipe! These look so good! I love cooking with anything almond and will definitely be trying out this recipe. YUM! Those look very very yummy. I just want to pop one in my mouth. moving..ugh~ I don’t even want to think about it after 24yrs (and two kids) at the same place; Gah! How many stairs to climb at the new place? These cookies look good to me! I love the flourless puffs of sweetness especially if they have nuts or are made from nuts. My MIL makes a cookie similar to your merangues w the choc chips. Her’s have dates and nuts and are like chewy, crunchy, melty little puffs of air. Oh, man..I just love those! These look yummy! I’m moving back to the States from France next month, and will no longer have access to a steady supply of macarons. These might do the trick to satisfy my cravings! I LOVE amaretti cookies!! and I loathe moving. I love it when you make cookies! Also currently in the process of moving. And this time I have a kid. Which means not only my crap-o-la is being packed up, but every article of clothing my child has owned his entire life. (Okay, so that’s only 18 months, but seriously? Have you ever looking in a toddler’s closet?) Obviously, the perfect remedy is cookies. I am such a sucker for anything almond-flavored. Good luck with the move! I can only imagine how daunting it would be to pack up my apartment right now..
Um, yeah I have a recipe binder from last year. It took me awhile to catch up to this whole “food…internet” thing. I have so many clipped recipes laying around, internet or no internet that I know I’ll never get to make them all! So now I really want to go to the store. These look amazing. I also just found out my boyfriend hasn’t had flourless chocolate cake. I have to fix that soon. Those are delightful! Mmmmm…would be SO good with coffee! Good luck with the move…I just went through one too, I know how awful it is. I have only had amaretti cookies once before, and they were really tasty. Where can I get almond paste?? thanks for the recipe…looks delish, from one marzipan addict to another. good luck with the move, too. I’ve heard studies that found moving to be one of the most stressful activities one can undertake. which means, be prepared to self-medicate with plenty of chocolate! Erika — Haven’t tried it but it sounds like it could work — and that it would be insanely delicious. Kirby — I get it in the baking aisle. I mean, that’s where it is in my stores — sometimes in a can from Solo or whatnot brand, sometimes in a tube from Odense. The tube stuff is better but both work. Erika — I don’t have much experience with chestnuts, but you piqued my curiosity. What WOULD one do with chestnut paste? Well, I searched the Flavor Bible to see what is often paired with chestnuts. In bold capital letters it says CREAM OR MILK. Another bold is chocolate, especially dark or white. Another bold is vanilla. Another is rum. You know where I’m going with this, right? Chocolate chestnut ice cream. Put a splash of rum in there to keep the homemade ice cream from freezing rock hard, and I think your Paris purchase will be put to excellent use! To Ashley (#25) I make my own almond paste too and the only thing that prevents me from making a huge quantity too far in advance is the knowledge that I’ll happily scoff it all and goodbye cookies. I’m so happy to see this recipe on SK because I diligently wrote down a very similar one from a book called “Sweet Sicily: The Story of an Island and Her Pastries” a while back and dreamed sweet dreams of making these chewy morsels. Glad to see them tested at last! Only difference here are the egg whites in addition to the paste and sugar, and I’m going to go with SK. The idea of using ganache for sandwiches is just SINFUL. I love my recipe binders, I add comments in them for the nieces and nephews to find years from now. I love the internet too but no one will treasure it like they will treasure finding recipes for dishes they loved at my home. Best moving tip: Buy boxes from Uhaul, they come flat and you just tape them up as you need them, they stack perfectly. Then, hire strong men to do the heavy work! You will be exhausted just unpacking and putting away. Boxes fold flat again and you can sell them on craigslist. Can’t wait to hear about your new kitchen! I love moving. Pack it up or pitch it out…either way: cleansing. Those look awesome! I’ve seen almond paste in the store and I like marzipan and macarons, so I’ll pick some up sometime and make these. I don’t have a food processor, though – could I mix it in a Kitchenaid? awesome! i am so excited to experiment with wheat-free desserts for passover! i am going to try and make vegan flourless chocolate cake. i just hope it isn’t a disaster. I’ve never posted before, but I absolutely love your blog. Visiting it is such a treat! I have to admit I’m jealous of these cookies! They’re so pretty. I’ve tried to make these using a similar recipe a few times, and each time the cookies have puffed up in the oven, then deflated, then cracked and crumbled as I’ve taken them off of my Silpat. Do you have any tips? Thanks for your glorious blogging. Late to the Table — Can we rent you?! Those of you without a food processor — You can use a stand or hand mixer. You’ll have to do a lot of bowl scraping and probably a lot of mixing to get those chunks of paste really broken down, but it works. I’ve broken down almond paste successfully in the Kitchen Aid more than once. Kelly — Not sure what is happening for you. They do deflate a bit when you take them out of the oven (actually, I noticed that the ones that were a bit underbaked deflated, the few I think were really cooked until golden managed to stay puffed) but once they’re cool, I had no trouble removing them from parchment paper. Well, I did so carefully, but they came off in one piece. I know that Silpats are supposed to be just like parchment paper — that is, silicone coated — but perhaps in this case, the paper might work better? You can always lift it to gently press the cookies off from the back if one seems especially stuck. They look amazing! And they’re so cute! Good luck packing – I’m always surprised with how much “stuff” we find too. Good luck with the packing and moving. Where are you moving to? I want to thank you for posting Francios Payard’s Flourless Chocolate Walnut cookies (last year?). I made them a few days ago. A huge hit! Everyone loved them and asked for the recipe. My cookie dough didn’t come out looking soupy like yours did. Mine was very thick and lumpy. Did I use less egg whites then I shoud have? Not sure. I defrosted a bag of egg whites I’d had in the freezer and thought it held four egg whites. But the main difference is I let the egg whites defrost and stay on my kitchen counter for about 12 hours. The viscosity of the whites goes from thick an gloppy to thin and watery. I did the recipe with just a large wisk then a big rubber spatula so no beating whatsoever. Also, I used “Green & Black’s” organic cocoa powder and it had a rich chocolate flavor. Mine puffed up a little then cracked. Delicious, chewy, nutty perfection. Everyone — try this recipe, you’ll love it! I tried these with 3/4 cup sugar and they were still very sweet. I didn’t pipe them though, instead dropping them onto silpats with a spoon and flattening them into large circles – I got 16 flatter cookies instead of cute small ones, so I regret that now. Once they cooled they came off the silpats, but when they were still warm I was amazed that they stuck to the silicone so solidly. I think I’d try a half cup of sugar next time, and piping them to keep them puffier. Almonds and raspberry? – I do believe I am weak in the knees! Funny, when I am moving there is nothing but take out, cereal and bagged salad – not perfect little rounds of heaven coming from the oven. I know exactly what you mean!!! We moved in February and there are still packing cases with stuff we found during packing (things we didn´t see for ages!) and now we don´t know what to do with it. Curiously it all was “invisible” in the old, small apartment…but we can´t find room for it in the new twice-as-much-space-apartment now. :o) It´s jinxed! mmm ! These look amazing. Ok, I admit it. I actually copy and paste recipes from your site into a computer file of things I want to be sure to make. Then I print it out, make it, and if it is REALLY good the printed paper goes in a hard copy recipe file. I can’t tell you how much I cherish my mothers and grandmothers recipe boxes. It is the handwriting, mostly. My kids, now in their 20’s, have handwritten journals I update yearly with recipes and family stories. I don’t think we have an equivalent of almond paste in the UK – does anyone have a good receipe? p.s. Erika–if it was me, I’d just squirt the chestnut paste right into my mouth from the tube, chesnuts being my second addiction after marzipan! Liz — almond paste is also called marzipan. I know it’s used in english sweets, so maybe you can find it under that name! Good luck! Sorry, I should have been more specific re marzipan — there is some variance over what it’s called in different countries, but basically my understanding is it’s a type of almond paste with a bit more sugar. See http://www.ochef.com/1087.htm . Hey! I still have a recipe binder! I keep all my favourite recipes in there. Most are print outs from the web. Some are things written down by my mommy. But I had to learn the hard way with knitting websites, just because something is on the web today doesn’t mean it will be tomorrow or the next day! Recipe I use for almond paste: 250g blanched almonds, 250g icing (confectioner’s sugar) plus 1 egg white. Blitz almonds and sugar together in food processor or coffee grinder. Add egg white gradually to form a paste. 3 1/3 cups blanched almonds, 2 cups sugar, 2 TBS honey, 2 tsp vanilla, 1/4 tsp pure almond extract; 2 eggs, beaten lightly, 1 tsp lemon zest, pinch salt. Again, grind almonds and sugar together to form a fine powder then add other ingredients with machine running to make a ball. Wrap in plastic if not using right away. Apologies if I’m not supposed to post recipes! oh wow these look amazing! These cookies are scrumptious. Try sandwiching them with Apricot jam – unbelievable combination! Almond paste and marzipan are not exactly the same. They taste the same but marzipan has some additional “stuff” in it that makes it sculpt-able — you know, so you can make those roses/frogs whatnots you always see airbrushed in Italian bakeries! You can, for example, roll marzipan into a fondant-like sheet, but it is much more difficult with almond paste. And yes, you can make almond paste at home. In fact, this might be a great solution to the too-sweet issue because you can then dial back the sugar already in the almond paste (from a tube or can, it comes very sweet) and perhaps end up with a more balanced cookie. I have seen many recipes out there [including Nadia’s above, thanks for sharing] and am not sure which one would be closest to the tube/canned stuff. One note about confectioners’ sugar: It is not technically Kosher for Passover because it contains corn starch but it is easy to make a version that is with potato starch. These cookies look great! Also, if you’re into marzipan, did you know that Ben and Jerry’s just released a new flavor…Mission to Marzipan? You need to go find it ASAP. It’ll be requisite medicine for the move, I’m sure. Oh my, I need a bowl of it right now just thinking about it. Good luck with the move, I know how tiring it can be. Good luck with the move – can’t wait to see what the new kitchen looks like! Hi, Deb–I’m thinking of making these for my Passover contribution. What’s the yield on these cookies? The recipe should make about four dozen cookies, or half as much if you sandwich them. Macaroons are the best when they are sandwiched with raspberry jam. Such an inspired pairing. I feel like I want to reach into my PC and grab one of your beautiful treats. You can also make a great ice-cream sandwich with them. Kind of like a Passover profiterole! So I’ve been reading your blog for about a year now, and I must say. I have a bit of a food crush on you. I want to try making these ASAP, I just need to start looking for an excuse or somewhere to take them… I made your chipotlet brownies last weekend and they were a kill. I hate you for your peanut butter chocolate chip cookies which make me dream more of peanut butter than i thought previously possible, and now these… You just had to also link to these chocolate cookies from your past which I hadn’t yet seen too, didn’t you. i took a sick day, and first thing i did was bake these. still need to do the ganache. i started to use my very old piping bag, and realized i didn’t have all the parts, so took a ziploc-like bag and nipped a corner and plunked down the nib into the corner, but i developed leaks in the bag and had little streams of batter squrting here and there, but i perservered and made um. they still turned out perfect. thanks. Me and almond paste are best friends :) I LOVE making these cookies, so easy and so good! Is that really the list of ingredients? It’s nothing! What an easy fix. I just happened to have a tube of almond paste in my cupboard so I went home last night and made these. The whole family loved them. Except one son that’s allergic to almonds. But why should the rest of us suffer? Ha! Baking secret here: A professional baker suggested this. It works! His recipe uses 3/4 c sugar but is otherwise exactly the same. Any tips on making these without a piping bag? Can the dough be put into a ziplock and piped through a hole in the corner? They sound great for Passover! Cookies look lovely, but I have a different question…how DO you organize your recipes these days? I don’t find it any easier to keep track of recipes I want to try now that there’s the internet. Sometimes I’ll email myself a recipe from the internet to try and generally speaking these stay in a folder in my email called “Recipes” and are never seen again. Sometimes I’ll actually remember to print out an interesting recipe and then we are more likely to try it. If it was worth it, we throw it onto our huge totally haphazard pile of paper recipes that we shove into our cookbook cabinet. Finding one of these slips of paper when we want to make the recipe again has caused SO many fights in my household. My husband, who does 99.9% of the cooking, keeps saying he’s going to type favorite recipes into some online organization program he found, but a.) that seems like a crazy amount of work to me and b.) he’s never gotten anywhere with that other than to take a bunch of recipes into his office so it’s even harder to find them. Any thoughts? If you don’t have a piping bag, a baggie with the corner nipped off should work, too. I organize my recipes mostly in Google Docs these days — I like the fact that it means I can get to them anywhere I can log in, and I like having everything I want to cook one day in one place. The main document is a very long list — most items linked to some place on the Web or with a note of what cookbook it is in or reminding me that it’s in my Gmail (I have a bunch of emails tagged “Recipes”) — and another contains actual recipes I had no other place to store. I’ve also “shared” it with Alex, so he can get to it if I’m not by the computer and/or suggest things I’d forgotten about. I am, in a word, rather obsessed with Google Documents! Thanks for the quick reply Deb. I’ll check out Google Docs! I love that they are CHEWY amaretti cookies–I favor chewy to crispy every time! Also I love Suzanne’s idea above about making “passover profiteroles”! Awesome! Beautiful. I can just imagine their amazing texture. Your photos always do a great job of helping us virtually “taste” your creations. I’m definitely making these next week for my son’s teachers. I get my almond paste from King Arthur flour. Theirs always seems to be pretty fresh. I have all the Bon Appetit from 1985 onwards. My husband want me to throw them out but I can’t bring myself to do it. Every time I start I find recipes that I never got around to trying. Plus, it’s a slice of food history. Remember America when it discovered scones for the first time? It was non-stop recipes for every type of scone you can imagine for a solid year. Oh why do you tempt me? I can’t eat tree nuts anymore because of an allergy- and I miss almonds so much. These look fantastic. Glad to have another Passover treat in my repertoire. I get almond paste from a Dutch bakery. Love your blog! I’m a big fan and foodie. But, these adorable cookies are look so tasty and tempting! What a perfect little snack. Amazing texture in the photos. I envy you for baking such lovely cookies during the packing and moving process!! thank you so much for this! i’ve only tried baking macarons once and, to put simply, it did not work. i think these will go much better. As time-consuming as packing up can be, it’s so much fun to find stuff you had completely forgotten you had. I love that you found your recipe binder and that these cookies resulted. They look delicious!! Oh geez. I love any pastry/cookie/cake with almond of any kind in it. And what did my dr just tell me I have an allergy to? ALMONDS!!! When I asked if I could eat almond cookies and just have my Epipen next to me she laughed. She said I could eat them if I am in the parking lot of the hospital. These cookies tempt me enough to make a batch and go sit outside the ER while I scarf them down. Food allergies are so unfair. how many cookies does this recipe make? The yield (4 dozen) is listed in the recipe. New Yorkers — I was over at the Cake and Baking Supply on 22nd Street (because I live there, it seems) and saw that they sold both the Odense almond paste and marzipan for about $2 less than I’ve seen in grocery stores, I think in the $5-range instead of the $7s. i still actively keep a recipe binder! these cookies look great. I made these cookies last night and they were delicious! I almost bought cookies for my card club because I didn’t think I had enough time to make them, then I saw this recipe on my igoogle page. They were super easy and fast to make and a BIG hit! OK, I’m a total Lame-O. Last weekend hubby found a food processor in our storage locker. It was a wedding gift and we’ve been married 6 years. The box has never been opened. I’d love to use it and am considering it for this recipe… it has a blade but nothing that looks like a mixing paddle or similar. Can I use my machine with blade to “mix” recipes like this? I can’t wait to make these for Passover. Love amaretti cookies and almonds. What a treat. Thank you. Sweet Georgia Brown. These cookies look sooo good. One of my all time favorites, never really had a great recipe though. Now I have 1 to try. And chocolate ganache????? Why did I not think of that myself? I couldn’t wait for these to cool, so I ate one of the broken ones – YUM!!! These are great for passover – I will be storing these til Wednesday! If I can hold out on them that long…Thanks so much for posting this timely recipe! mmmm…. these look VERY good!!! I love all the pics! I should know by now that you are ALWAYS RIGHT. I didn’t leave enough space between my cookies, and sure enough, just now when I went to rotate the trays, some had spread together. Oh well. I guess my roommate and her family will just have to deal with some less-than-perfect cookies =). Tracy — I am not sure what paddle/blade you’re talking about, so I don’t know if it would work. I’ve been reading your blog for over 2 years now and it was just yesterday (eek!) I finally made something! It was the easiest thing probably on your whole site – your pickled red onions with the stuffed peppers. I made the onions and they were amazing. I’m on a SK roll now! I made your poached eggs this morning (practice one went into the drain but the 2nd was perfect!) and they were delicious – I loved your toast fingers idea! Tonight I’m making the napa cabbage salad with buttermilk dressing and the brined chicken breast from the chicken caesar salad, and then the passover-friendly peanut butter cookies from the 17 Passover Friendly desserts. I can’t wait! Thanks so much for continuing to create my favorite (and most beautiful) food blog! I made these cookies with half the amount of sugar (1/2 cup) and they were fabulous. No need for a full cup. My only mistake was making my cookies too big–they weren’t the right size for sandwiching with jam or chocolate. Next time I’ll flatten them out as much as possible. On a different note, I made the wonderful sourcream chocolate chip coffee cake that was posted recently and it was a big hit (again I used a smidge less sugar than the recipe called for–I think we Americans are just trained to use more sugar, even when it’s not necessary). I love this blog and the pictures are gorgeous!! I had to find almond paste that did not contain flour so I can make these cookies. All the ones in my stores that came in a tube contained flour and/or soy but I found a can of Solo Almond Paste that did not, so I am going to try these cookies next weekend. I am loving the site and look forward to cooking from your example! mine came out a bit flat but i think i may have over cooked them. i had just baked some no knead bread and i don’t think the oven had enough time to come down to 300 degrees. i used tubed almost paste in a blender and it worked fine but i made sure to cube the almond paste into small bits before throwing it in. The cookies look like the perfect thing to help you with the less desirable job of packing. Bonus – you get to weed out what you don’t need. But – I’d have a few of your cookies first. First… YUM. I may do ganache/raspberry. Second – if you know and are inclined to answer: Do you know if these pretties can be made into crunchy amaretti? I was thinking of leaving them in the oven longer and at a lower temperature, but thought better to check with you than to screw up a batch and have to secretly gobble my “mistakes”! I wanna make a few cookies to crumble on some butternut sage raviolis I have sleeping in the freezer. This look really, really yummy! I just made these this afternoon. They have the most perfect chewy texture and gorgeous crinkled tops! I put tart homemade lemon-raspberry jam between them…and WOW. Thanks for the recipe. Can these be made without a food processor? They look amazing, i want to make them, just not sure if I can without a food processor? It sounds like people in the comments have been successful using blenders and/or hand and stand mixers. I lovelovelove macarons, particularly chocolate…and the idea of making simple ones is so enticing! I’m going to give it a go. Thanks! Where is the recipe for the chocolate layer? In the recipe. Second to last paragraph. ooh, I love these! Much less intimidating than macarons. I have a friend who loves anything almond flavored, so these will make a great birthday treat for her. Also, I haven’t moved from my apartment in 4 years because I HATE moving. Thank goodness I love my apartment, but I can’t even imagine how difficult it’s going to be when I do finally decide to head somewhere else. Good luck! These are so cute and dainty. I have a “recipe box” with all the recipes I clipped over the years. It is bursting and in no order what-so-ever! But I still go to it. I don’t have a laptop so looking on my computer means printing out recipes and then there is all the paper… Wasteful? I made these cookies and they are delish and chewy- they almost taste like cotton candy. I made my own fig jam with dried figs I simmered in mulled wine, sugar, and orange juice and spread it in the middle of these guys. However, I forewent parchment paper and had to battle to get them off of my cookie sheet. Lesson learned. These were amazing! I have a friend who was recently diagnosed with celiac disease and so she is now on the no gluten train. I made these for her on Saturday and between the four of us, we at the ENTIRE batch. Oh my. It happens everytime. I am looking at today’s offering from your kitchen and there is a mention of another recipe from a different day and so I go to it because one sounds as good as another and of course that recipe has a link to another or someone mentions another recipe and off I go to that one…hours later I have forgotten where I started but boy am I hungry and so anxious to try a recipe but now I have 10 recipes to try because I have yet to see one that doesn’t look good even if it has things I don’t normally love…if it looks that good it must taste good. You are a slippery slope and I can hardly wait until tomorrow to go sliding again!!! Good luck with the move. Those cookies are right up my alley. I just made some BLACK SESAME PASTE for mochi. Upon inspecting it, I realized how similar it was to MARZIPAN. Then I was reminded of your post, and realized that my next mission should be to make amaretti cookies with black sesame instead of marzipan. Black sesame is the new marzipan. You hear it here first. I have a recipe binder still! how do you keep everything organized? Do you keep everything electronically? What about a recipe you see in a magazine, and rip out for later? Please share your recipe organizing tips!! I talk about how I organize my recipes in comment #91. I just finished making them and only used 1/2 cup of sugar and gosh, they’re delicious up until the after taste that is almost medicinal or alcoholic in some way. I wonder if the extra sugar is needed to mask that taste? Or if my almond paste (picked up at an Italian grocer) was off? I just picked up the Odense paste down at Safeway and the box says it contains wheat. So – doesn’t that make the cookies not gluten-free? I’m so bummed! They’re only not gluten-free if a brand with wheat is used. There are other options. these look just lovely. I wonder if the texture is in any way similar to those German ground hazelnut cookies that are made around Christmas time (the name completely escapes me!)? I’ve been wondering what to do with some almond paste that I bought to use in an apple tart that never happened. Now I know!! These look yummy! These look wonderful! I will have to try them out. My family, too, LOVES everything almond! Ooookay, now I’m going to have to stop and get almond paste on the way home from work. I love almond and I love chewy cookies, so chewy almond cookies are just all kinds of awesome. Not to tread on your toes, Deb, but an option for keeping track of recipes: I use SousChef on my laptop, but recently I’ve started using something called Evernote. You can clip whole pages, or bits of text, or screenshots, or compose an original (rich text) note. Webpages and text/images from webpages are stored with the URL so that you can return to the page later. Clippings are taggable and searchable, and can be organized into notebooks. And you can sync among different computers, with the web interface, with your mobile device, etc. I use it for my weekly menu planning (which I tend to do at work but want to access at home), flagging recipes, writing grocery lists at home or work and then accessing them from my mobile once at the store, and so on. Software exists for PC, Mac, and mobile devices and is free for most features, or you can pay for premium features. I’ve been happy so far with the free version. I just wanted to let you know that tonight I successfully (albeit the paper plates–I just moved across the country; shipping ceramics isn’t recommended) hosted a dinner party, mostly thanks to you! I used your recipes for 44-clove garlic soup (by far my favorite, oh boy), Bulgur salad with chickpeas and red pepper, and Mixed bean salad. In the mad rush to finish dinner, the amaretti cookies got left by the wayside, but i can smell them puffing up deliciously in the oven right now. Thanks! Happy Passover, Deb. Hope y’all had a nice seder. I made your matzoh ball soup and it was soooo good. Thanks! Wanted to let your readers know that there is an organic powder sugar, although possibly only available in Texas. It’s acceptable for Passover because it’s made with tapioca starch. It’s HEB’s (out of Austin) Central Market Organics brand, made in Paraguay (interesting!). I made these cookies for last night’s Sedar to rave reviews. We sandwiched them around raspberry jam. Great for Passover and the GF people at the table LOVED them too! Thanks so much. I hate to sound like a broken record, but made these for seder tonight and they were a HUGE hit. Had a little bit of a hard time getting the baking time just right–some were a bit too brown and others were a bit under-cooked, but both types were delicious. Even the non-Jewish Frenchies at the seder were raving, and they should know, right? Served some plain and others sandwiched around black currant jam. Both amazing. No kidding about giving lots of extra space, though! Thanks for this great recipe! Made a batch of these last night for tomorrow’s Strawberry Hill Races (I hope to continue my tradition of never spotting a horse, why spoil the fun?)….delish!! The only issue is making them last until tomorrow. Odds are against them seeing another day. Sorry to rain on this kitchen’s parade but just to be annoyingly technical, most commercial almond paste also contains glucose syrup which is WHEAT starch. And, well, wheat is a big fat no-no on Passover. One brand that is gluten-free is by “Love’ n Bake” and usually can be found at Whole Foods. I, personally, don’t mind as I am a big Jewess only on paper and will still make these cookies with my faux-kosher paste but for others who might be more adherent to the rules, I suppose a safe bet is to make your own! Anyway, Deb, thanks for all of your really great recipes, writing and especially your photos. I am a Smitten groupie. Would I be a crazy person if I attempted these cookies without a food processor OR a hand mixer? I should really invest in one of those. These cookies are so tempting! PS- Upper West Siders, almond paste is $5.29 at Fairway. Made these tonight after thinking about them for days, and they were so easy and so worth it! Only used 1/2 cup sugar and found that they were plenty sweet, especially with a jam filling. Using a piping bag helped contain the messy liquidy “dough” and form them into nice pretty circles, which was indispensable in making them into mini cookie sandwiches. Thank you for the recipe! Mmmmmm, cookies! And they are made with ingredients that are always in the house, which means I can make them anytime! Thanks for the great opportunity!! Katie — It will be hard to break up the almond paste and get it smooth, I would think. Do you have a blender? That might work. Do let us know how it goes. I did end up using a blender. I nearly burned it out in the process, but the aroma of charred blender turned amaretti as the cookies baked. I’m not sure the process was perfect, but it worked in a pinch, especially after the addition of the egg whites. I’ll bring the cookies to Sunday brunch, assuming there are any left after my roommates get at them. Thanks, Deb! How can you get pretty crinkle top? After reading the thread and fearing about making too sugary cookies I used only 1/4 cup of sugar in placement of what the recipe called for. They taste wonderful and everyone loves the flavor but my almond cookies have way too smoother top. Is sugar the necessary ingredient that will help creating crinkle top? I made two batches of batter, tinting one pink and one green. Now we’ve got pretty pastel amaretti sandwich cookies for Easter dessert — raspberry between the pink cookies and Nutella spread between the green cookies. They are so pretty and they look like those fancy french macaroons. Juhee — My batch was a tad underbaked (everything takes longer in my oven, but sometimes I still forget this), so they “siiighed” a little after they were cool, hence the rough top. I made this as a kosher for Passover dessert at an Easter dinner and it was delish. I made a double recipe, it in two tart pans for more like 25 minutes, and then put chocolate raspberry ganache my housemate just happened to have made tons of between and on top of the two layers. It was rich and amazing and I’m looking forward to getting to eat leftovers all week. Darn it – mine doesn’t look as pretty as yours do; what makes your crackle at every bit? I made these and people gobbled them up. Probably the simplest cookie I’ve made to date. I did get a few comments that it was really sweet. I’ll try cutting the sugar to 1/2 cup next time. I didn’t really care though, these were freaking good. My mom made these to accompany her home-made creamy lemon sorbet and OH MY GOD. Heaven!! Thank you for making our Easter weekend a great success!!! wow, these look amazing. simple, but amazing. These cookies look amazing! You have a great site! You’d think with a recipe that has only 4 ingredients, you couldn’t mess them up – but I managed. Mine turned out very thin and brown on the bottom, with none of the puffiness that yours seem to have in the pictures. Also they were incredibly chewy, and not in a good way… any thoughts on what step I did wrong to cause this? I love anything with almond paste!!! I think the extra ounce of almond paste may account for why mine were less flat. These sound amazing! I can’t wait to make them. I made these last week with a hand mixer and about 3/4 c of sugar and they still turned out quite tasty! And then I made a ganache using raspberry filled dark chocolate baking pieces. Thanks again for a great recipe! I made these with the recommended 3/4 c of sugar. They came out very tasty but I had a heck of a time getting the almond paste broken up and the batter smooth with my immersion blender. Also were not puffy and pretty like the photos, but they are so good that I am determined to try again with different technology! You can use a plastic bag with the corner snipped off. Or, if you’re crafty, you can make a pastry cone out of parchment paper. There are many, many recipes for it on the Web. However, because I have not tested this recipe with homemade almond paste, I don’t want to recommend one over another. Do let us know if you try it, and how it goes. be careful with the type of almond paste. some contain gluten! Made this recipe over the weekend and oh they do not disappoint! I don’t have a food processor or piping bags, but managed to make it work by buying almond paste (the one in the tube) that felt nice and soft, then I crumbled the paste and sugar with my fingers and a fork, getting it pretty small. I processed the mixture in small batches in a mini-food-chopper type device that I suppose is like a food processor but seriously lacks on power. It ended up working out fine though. I also used a ziplock bag to pipe the cookies. I ended up filling them with both chocolate ganache and raspberry jam, but next time will probably just go with the jam. The cookies have a delicate flavor that I think the ganache overpowers, but maybe that’s just me. If I use marzipan instead of almond paste, by how much should I reduce the sugar? (I bought a tube labelled “almond paste,” but when I got home, I noticed it says “marzipan,” too). The marzipan I bought contains 180g of sugar in a 227g (8 oz) tube, which makes it 79% sugar. How much sugar does almond paste have? I would appreciate any input. I want to make sure I remove enough sugar; I’d rather have less sweet cookies than tooth-achingly sweet ones. Thanks. After living in HK for a year, as soon as I saw this post, stirring in sesame seeds (or maybe venturing into making sesame seed paste version?) and sandwiching them with red bean paste. Sweet and savory – Yummmmmy! Mine won’t puff up! They flatten and I have to take them out before they burn. Any suggestions? Mine came out flat as well. Also, I tried the recipe with half the sugar and I thought they were perfect. They were STILL really sweet so I can’t imagine how sweet they would have been with a whole cup. Removing half the sugar will affect the structure of the cookie. I am so sad. I don’t know what I did, but I screwed up this cookie. I definitely made them too big, but then they puffed up way faster and baked faster, but the second I took them out of the oven they went flat within seconds. I didn’t alter the recipe at all. Does my oven maybe run too hot? I don’t know what I did wrong. My new favorite holiday cookie! I made these over the holidays and not only were they a hit with me, but everyone who tried them. Simply delish! Deb, I just made these tonight and they’re great. Mine fell flat as well, but I’m not one to care too much about looks :] If I could do one thing differently, I would have reduced the sugar a bit, but a little toothache never hurt anyone! Made these today — they’re fabulous! Thanks so much. About 3 T. less sugar is good in Colorado, helps to balance out altitude. And I wanted to tell you, I have a 9-month-old baby and work outside the home part time, and we’ve definitely eaten our share of frozen pizza and take-out recently. Your blog, which I started following about 2 months ago, has been a big motivator in getting me cooking again. In the past two weeks we’ve had Key Lime Coconut Cake, the warm butternut squash salad, the tomato-butter-onion sauce, and tonight almond cookies. (Um, should probably invert the salad-to-dessert ratio soon…). I really appreciate you! I am very glad I hit that keyword “Passover.” These sound scrumptious and way more interesting than the ho-hum coconut macaroons I had originally planned. Cool! I just made these cookies. After reading your comment about them being very sweet I measured just a little less than a full cup of sugar and then threw in 1/3 of a cup of cocoa powder to cut the sweetness a bit more. I think i like the results! Turned out really pretty and love the chewiness, but the first hit really is just “sweet” before I taste almond (I added less than 1 cup sugar). I’ve had these at bakeries before where they’re not so cloying. The search is on for a recipe. One might wonder if this recipe can be made with marzipan (if, perhaps, one got frustrated by the lack of almond paste in multiple stores) and the answer is…. perhaps. I first made the recipe with almond paste (because I might have felt bad about my marzipan purchase and decided to go to just one more store and voila!) and then because I had marzipan on hand (dammit. and, realistically, when was I gonna sculpt mini pears and pigs? never) and thought “ehhh let’s try this too.” Because marzipan has more sugar I cut the sugar in the recipe down to 1/3 cup (I used 2/3 in the almond paste version) which gave the cookies the right sweetness. The main problem is that the marzipan version was wetter than the almond paste version which made the cookies run more and puff less. I’m not entirely sure how to fix this… maybe a bit of corn starch? perhaps meringue paste in place of one egg white? I can’t wait to try this recipe and bring it to my daughter in DC – she needs gluten free and it’s hard to find things that actually taste good that are bakery or bread items. Thanks for including gluten free in your list – we’re looking forward to more great recipes! ABSOLUTELY AMAZING COOKIES!!!!!!!! EASY AND YUMMY RECIPE!!!!! MAKE SURE YOU KEEP THE COOKIES APART BECAUSE I PUT MINE TO CLOSE TOGETHER AND THEY STUCK! :( OOO WELL THEY STILL TASTE GOOD!!!! <3!!!!!! Just as an FYI – here is newer info on Odense Almond paste – it’s NOT gluten free. Sorry. I am on a rosewater kick. Do you know what adding a tablespoon of rosewater would do to the cookie’s consistency? These are wonderful. Nice mix of crunchy and chewy. I make my own almond paste b/c I like a little more texture. Almond paste is just blanched almonds, powdered sugar and egg white. 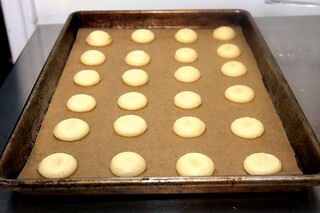 I have a bunch of egg whites leftover from making french eclairs yesterday – now I know what to make – amaretti cookies. Thanks Deb! Seeking wisdom! I just made these tonight, and I think I may have erred somewhere. The cookies are indeed very chewy, but after a few chews it becomes a gritty rubbery mass. (Still tasty.) The best way I know how to describe it is the texture of Airhead candy; I suspect it’s nearer to the texture of a hard candy — but I’m pretty ignorant. Any idea what would cause that? Or is that what it is supposed to be like? Possible issues: my food processor is weak and small (I processed half the ingredients at a time), a teeensy bit of yolk may have gotten in there; the dough was stashed in the batter after pureeing for about 10 minutes; and I used a silpat instead of parchment. Thanks! I love the recipes and the community on here. Made these tonight with a blender(had to shake the pitcher a few times to get stuff to blend) and shoved the mixture into a ziploc bag. Followed the rest of the directions(you ain’t kidding about giving these cookies space to bake!). They worked beautifully, taste crazy delicious, and so simple! Thank you! Hello Deb! I LOVE your website. Just made these today to bring to my gluten-free my mother-in-law. Made the odense version 1st and then a 2d batch with a homemade almond paste recipe I found on food.com, after I realized that the odense paste is not “wheat free.” They both came out great, tho the homemade almond paste was more light colored (almost white) and airy-er in texture b/c of the added eggwhite in the paste recipe. They are all beautiful little morsels! I used a silicon cookie spatula to loosen them from the parchment after fully cooled. No problems there. Big P.S. here: I accidentally baked a batch of amaretti that look exactly like the adorable, famous Macarons – pied (the foot) and all. The accident happened b/c I piped them onto my pans but had to wait 1/2+ hour before I could bake them (b/c DH coopted the oven and was baking something else at 400F). I’ve never made macarons before, but it was on my to-do list, as my sister bought me “i heart macarons” by hisako ogita — after relooking at her basic macaron recipe it does say to let the piped batter to sit and air-dry for 15 minutes…. Deb’s simple amaretti recipe is a great stepping stone (or substitution for!) macarons! Thanks, Smitten! A friend of my daughter’s gave me the address to your website and last night I made these cookies for a meeting….and brought home THREE [even though one of the gals wanted them!] They were so easy and tasted so like something from my childhood – BUT without any effort. I love them! Everyone at the meeting wanted the recipe – so of course they will become new fans just like ME! Thank You. Hello everyone! This recipe is so unique and I cannot wait to make these! I literally was drooling when I saw the picture! Two of my favorite flavors in one-almond and chocolate…mmmmmmmm. Does anyone have a recipe that comes close to the Fesh Market’s “Pillow Cookies”??? I have spent endless hours searching and the closest recipe that I have found is an old Dutch recipe but the cookies are cut in alphabet shapes. Has anyone ever tried a recipe like this before? The cookies from TFM are soooo soft and they have almond paste inside and then they are gently covered with confectioners sugar. (the recipes that I have found contained granulated sugar and/or brown sugar,,,big difference!) Also, does anyone know of the origin of The Pillow cookie? I have seen many recipes for pillow cookies but I am interested in the almond-filled only. Thank you and love to all. I’m a college student and this is my first year living in a apartment, and I have to find a way to survive Passover without my mom’s or the dining hall’s Kosher for Passover cooking. I just wanted to say how much I appreciate all your Passover recipes. Thanks! taaaaastyyyyy. This is one recipe where even if you mess up big time, like I did, the result is still tasty. 1. Got no almond paste (is it made with roasted almond or raw almond?) so throw in a handful of roasted and raw along with 1/4 cup sugar, 1 egg white and 1tsp vanilla. My 1 cup capacity food processor is incapable of making things smaller than very very coarse cornmeal. 2. Being excellent at glazing over the instructions, I saw it says similar to macaron, which somehow translate into meringue in my mind, and so I whipped the 2 egg white…except they didn’t really whip, so I got a slushy slightly foamy thing and then realized I didn’t need to. Combined both with another 1/4 cup sugar (very watery result, a bit too much egg white) but decided to bake it anyways. Came out tasting like a cross between maringue and vanilla wafer. Slightly crunchy and airy and almond-y and…a bit too sweet. Will be making it again as written when I’m not so airheaded. By the way, if it is too sweet, maybe making the filling in the middle without sugar, like unsweetened cream or bittersweet chocolate ganache? I’m currently eating my failure dipped in unsweetened whipped cream. Yum! The amaretti ‘batter’ was really thin, and when I piped it, it spread and wasn’t the appropriate consistency for me to pipe it 1/3 inch high. And it was really hard to pipe since it was very liquidy. I processed the batter just until smooth- maybe a few more pulses just for the sake of scraping, and my eggwhites were a room temp for about 45 minutes. Can you point out my mistake? Do you think it’s over/under processing? Thanks in advance and happy mother’s day! You, my pal, ROCK! I found just the info I already searched everywhere and simply couldn’t find it. What an ideal web-site. I made these today using 9 ounces of Odense almond paste (60 percent almonds), a cup of confectioner’s sugar and 2 egg whites, and I made 24 cookies out of the batter by spooning the mixture onto the baking sheets. Delicious and easy to make, but getting hold of almond paste is really hard for me and I have to rely on friends to get me the stuff when they can. OMG, my wife made these last night for a picnic in the park. They were to die for! Holy cow. So good. Thanks! I just made these with 1/2 c. sugar and homemade almond paste and they are AMAZING. They taste just like the delicious smell of homemade almond paste, but with a nice chewy texture (sort of like eating a spoonful of plain almond paste but better)! Sadly, these didn’t turn out for me at all! They were way too runny (ran into one huge pile) and after 20 minutes in the oven were still ghost-white. Is the recipe supposed to call for confectioner’s sugar rather than granulated? I’m currently making these with 2/3 cup sugar (as noted on the Odense box), and the first batch out of the oven is chewy and delicious! I’m going to fill them with raspberry jam and take them to a Holiday party later on. I made this recipe for a cookie exchange just this year. Everyone loved it, and I realized almond paste is my new favorite food. Unfortunately, I let my mother use my kitchen scale, and my almond paste was 8 ounces. I put the entire amount in, and left the sugar and egg white measurements the same. I didn’t notice a difference between mine and the picture above. Also, I couldn’t find the tips to my pastry bag (so typical), so I measured with a heaping teaspoon. After they cooled, I slathered the bottoms with melted chocolate and allowed that to harden before packaging. I love these cookies, and my kitchen smelled AMAZING for the next 24 hours. Thanks for posing this recipe! It’s my new favorite! idk if you’ve already commented on this, but mine came out hollow and crumbly, and the middles stuck to the silicone…did i underbake them or do something else? Just made these! I was vacillating between this recipe and another very similar recipe. I’m so glad I made your recipe! My cookies were flat -not nearly as pretty as your faux macaroons, no matter -they taset fantastic! I have fallen in love with Trader Joe’s Almond horns and have been unable to find a recipe for anything like them -this is a dead ringer! I add a scant 1/4 cup of slivered almonds to the batter and toped with a very thick ganache (less is better on these babies! I never would have thought). Then I spied the strawberries from the farmer’s market and genius! I sliced very thinly some strawberry on top and tasted -MUM! They are still cooling, can’t wait to try them when they are at room temp! Just tried the recipe with 1/2 the sugar. They’re still amazing! As always Deb, I love your site! Thanks for all you do, and Happy Passover! I have been looking for an amaretti morbidi cookie recipe for years after tasting them at Isgro’s in Philadelphia. I made these last night and can honestly say my life is now complete. Thank you! Just made a batch and I agree that they are very sweet. I cut the sugar to 3/4 of a cup since reviewers who did that seemed to have luck while some who cut it to 1/2 cup did not. It could definitely use less sugar. I may have made my cookies too big, but I got just over 2 dozen total. Sandwiched some with blackberry jam – very good! I’m working my way up to making the testy french macarons and this was a good step. 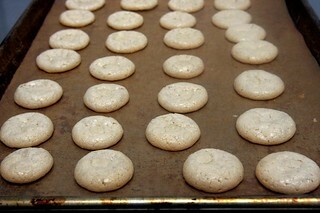 On to learning the Italian meringue method, which I’ve read gives better macaron results. I’ll probably make these again – would be very cute to make a few batches for a party and add different food colorings to each batch. Thank you so very much for sharing your recipe, I use to work for a kosher style Deli and they would order these for passover holiday’s. Once I ate one, I found myself eating at least a pound of them a day. I m not joking, it didn’t help I was also pregnant at the time. Since the deli closed, I haven’t been able to find these cookies anywhere. Matter of fact, no one at my work place has heard of them and look at me funny when I talk about them. I can not wait to get them hooked on them to. Thank you again. i was thinking about putting whipped cream in between the sandwich then roll it in coconut- perhaps the whipped cream would cut down on the sweetness? i have 1 question though- how long did you pulse the entire mixture for? my cookies did not turn out as fluffy as yours, perhaps i didn’t pulse it in the food processor for long enough?? First time I made these I used store bought almond paste. The cookies were perfect and delicious. Tonight, I made them a second time only I used some homemade almond paste and the cookies looked great coming out of the oven but deflated into flat disks. What went wrong? Why didn’t it work like the store bought almond paste? Any thoughts? Amy — I guess my question to you would be how the homemade almond paste was made… anything that struck you as different in texture or taste from the storebought? Sorry you had trouble. I admire the homemade paste effort! I even went so crazy to blanch my own almonds. The paste came out darker than storebought. It was still quite smooth and tasted fine. More nutty than storebought too, but good. Hmm. Further thoughts? I am so making ice cream sandwiches with these! BTW, I found that Target carries Odense almond paste, for about $2-$3 cheaper than at the grocery store. IIRC, it was $4.15 a tube. I don’t know what went wrong… I made the recipe exactly as written, and the yield was only 24! Thoughts? So when you say they can be frozen, is that before or after baking them? Is this a flash freeze and then I can put them direct into the oven? Or a bake, and then freeze? Thanks! I want to use this recipe for my pudding dish. However, do my egg whites need beaten until fluffy, and after the egg whites are fluffy do I fold them into the almond paste and sugar? THANK YOU FOR YOUR RECIPE! This is not a recipe that requires whipped egg whites. It will be tricky to fold whipped egg whites into almond paste unless it has been mixed in a little at a time until the paste is light enough that the rest can be folded in. It may not work that well, however. Sort of a random question. Is there a difference between almond paste cookies and amaretti cookies besides the name? From the recipes I’ve seen they seem similar, but doing a google search online didn’t yield any additional information. Anyone know? I’m rather addicted to the almond paste cookies at my local Italian bakery and I am very tempted to make these for when I’m craving them and unable to stop by for a batch. Mimi — I guess I’d need to know which almond paste cookie recipe you were thinking of to compare. It might be very similar, however. Thanks for following up. Here are two of the almond paste recipes I looked at. Here’s a different, but similar amaretti cookie recipe. After my original post, I continued to look online and it seems “amaretti” is used as an inclusive term for cookies made with either almond paste or almond flour. I think I was tripped up by the multiple names used for what seemed to be more of less the same cookie. Also, none of the sites I encountered seemed to make note that this particular cookie could be called by different names which I’ve come across in the past for other foods. What I am certain of is that your cookies look tasty and I have every intention of making them in the near future as well as picking up some more almond paste cookies from my local bakery. I make these with the box or can of Solo Almond Paste (cheaper!) and *no sugar* and they are FABULOUS! Just take a lot of forming if you want them to be smooth. However, I just make them for myself and let them be as peak-y as they like! Seriously, try them without any sugar at all – still so sweet! Love the taste of pure almond paste in these! A little less sweet: 8 oz pure almond paste, 2 pinches salt, 2/3 cup sugar, 2 egg whites. So I added 1 Tbs. rum to the 1 1/2 Tbs. of cream in the gananche…and it’s perfect. Just found this recipe, and can’t wait to make this for Passover 2016! So, I really want to make these but I went to the store and found a box labeled marzipan in a bigger box labeled almond paste… Will my cookies come out? Is there a way to make almond paste? Thank you! I made these last night with no added sugar at all, and they turned out so well! I was worried that the lost volume of the sugar would be a problem, but it wasn’t. I also drizzled melted chocolate on top then chilled, and the contrast in textures between chewy cookie and crisp chilled chocolate is delightful. Thank you, Deb! Just made these last night for Passover and I am going to fill them with raspberry jam. Tasted one and they are delicious. I used Love ‘n’ Bake almond paste which does not have wheat. Thanks so much for the recipe. These beauties have been on my list for a while. I know it’s not your jam, but I made them with aquafaba (1:1 for the egg whites) and it worked beautifully!! They were great! I used a little dab of homemade chocolate hazelnut spread to make the sandwich version. New family favorite! Very tasty and easy! I didn’t have the right size piping tip but they still settled down fine. I filled mine with sour cherry preserves which I would HIGHLY recommend, as it really accents the almond quite nicely and adds a tang. I live in New Zealand and and can’t find almond paste. I have researched and there are a zillion different almond paste recipes with all sorts of do’s and don’t and musts and mustn’ts. Can you recommend a good almond paste recipe? Thank you. I agree re: inconsistency in recipes; I don’t have a favorite. I can say from trying and failing, however, that I think the best texture comes from starting with almond meal/flour vs. relying on our own blenders and food processors (lest you have a Vitamix) to get the almond paste as packaged-like as possible. I know this post is nearly 10 years old at this point but I have been making these at Christmas for many years now and I just love them! The first time I made them I just happened to have guava paste that I used to sandwich them with and I’ve never gone any other direction. They’re amazing! My first time making these and I’m piping 3/4″ rounds and they’re … tiny. I’m actually okay with lots of tiny cookies but is this supposed to be 3/4″ radius and not diameter? This is actually a comment on this SUPERB recipe I made- ( not on Deb’s moving, her life, kitchen,lovely family or random thoughts on cooking- I am looking at many of you Smittens out there! ) I hope it is of help to those who actually will make this recipe. I used an 8oz, 227 g package of Solo almond paste,1/8 tsp salt to modifiy sweetness, 2/3 cup of sugar (thanks to many reviewers) about 2 extra large egg whites. (I initially had 3 thinking to whip them first and got scared off by the comments on how liquid the batter is.) As with many a brownie recipe that bakes to a shiny crinkled topping, I whipped the egg,salt and sugar to a glossy mass. I mistakenly used a hand mixer to add the too solid almond paste and had to stop and shred it in the food processor to make fine sandy crumbles which I then added to the eggs. It is a fairly loose batter with the consistency of a thick jam. I used a tiny scoop (about 5 ml) to place rounds on parchment, they spread to 1.5″ raw and only spread about 25% when baked. I ended up with 48 crunchy shiny topped soft centered wafers which popped off the parchment while still warm.I did not experience them deflating. I made a ganache using a bit more cream (3T) and a pat of butter( don’t know why I did that.) I should have piped the ganache as it was messy with a spatula. I compared the results to the best bakeries in my hometown of Brooklyn in the 1960’s. The others at my dinner party, all of the same era and experience , said no, much better.”Package and sell to high end restaurants.” This is a delightful recipe that needs doubling for a crowd. I have a bajillion egg whites left over from making key lime pies last week, and I found this through your “Too many egg whites?” post (how did you know??). Of course I just dumped all the whites together into a pyrex container when I was separating the yolks. Does anyone know how to measure them out individually? I’ve seen various estimates online, mostly converging toward 1 egg white = 2 TBSP, but I’d love verification! Thank you! I got about 15 1″ cookies, not 4 dozen. How does 7 oz. of almond paste make 48 cookies? For those who use ingredients labeled KFP, and can’t find almond paste, here’s what I did. Add to the food processor: 3/4 cup ground almonds, 1/2 cup plus 2T powdered sugar, 1 t almond extract, 1T water, pinch of salt. Blend until it forms a ball. I had to add a couple of extra drops of water to get there. That’s your almond paste. Then add the sugar and egg whites until well combined to get your batter. Mine was too thin to pipe, but teaspoon size blobs got the job done beautifully.